FULL SPECTRUM COMPLEX Combines raw turmeric root powder with a concentrated, 95% pure curcuminioid, extract and includes patented BioPerine® black powder for maximum absorption. HIGHEST MANUFACTURING STANDARD – No fillers, binders or unnecessary junk. Triple tested for purity and made in the USA in an ISO 9001, GMP-certified, FDA-inspected facility. Vegan and Non-GMO. MAXIMUM STRENGTH Antioxidant & Anti Inflammatory, Formulated for natural pain relief and Joint, Cardiovascular & Digestive support. A BRAND YOU CAN TRUST Tranquility Labs is a family-oriented company from Massachusetts that has been making top quality supplements in North America for more than half a decade. We practice what we preach, love our customers and obsess about quality and effectiveness. Shop with confidence that we are not some here-today gone-tomorrow “Amazon only” company, and see how we’ve kept our many thousands of customers happy through the years. 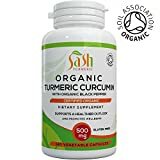 Tranquility Labs’ Turmeric Curcumin 1000 with BioPerine® is offers the BEST quality at the BEST price from a trusted Massachusetts supplement brand. Our formula features raw Curcumin powder (900mg/dose), amplified by a potent extract of concentrated Turmeric standardized extract (95% curcuminoids, 100mg/dose), and BioPerine (5 mg/dose) – ensuring both POTENCY, BALANCE, and BODY ABSORPTION. An Antioxidant from the East: Curcumin is a compound found in Turmeric root that has been celebrated for its curative powers for centuries. This special full-spectrum formula contains raw turmeric root, amplified by a potent curcumin extract to fight free radicals and inflammation, while supporting cardiovascular and digestive health.